Tuesday, January 17th at 12:30PM in Kane Hall’s Walker-Ames Room, the Henry M. Jackson School of International Studies, with the support of the Center for Global Studies and the Institute of Nuclear Materials Management UW Student Chapter, will host Rose Gottemoeller, Assistant Secretary of State for Arms Control, Verification and Compliance. She will be giving a speech entitled: “From Telegraph to Twitter: Arms Control Diplomacy in the Information Age” drawing on her experience as the principal negotiator of the New START treaty in 2010, followed by time for Q&A with the audience. 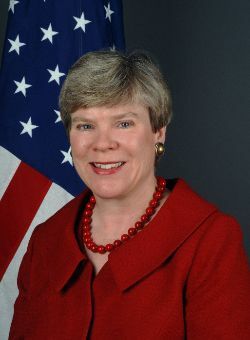 Prior to her work at the Department of Energy, Ms. Gottemoeller served for 3 years as Deputy Director of the International Institute for Strategic Studies in London. From 1993 to 1994, she served on the National Security Council in the White House as director for Russia, Ukraine, and Eurasia Affairs, with responsibility for denuclearization in Ukraine, Kazakhstan, and Belarus. Previously, she was a social scientist at RAND and a Council on Foreign Relations International Affairs Fellow. She has taught on Soviet military policy and Russian security at Georgetown University. Ms. Gottemoeller received a B.S. from Georgetown University and a M.A. from George Washington University. She is fluent in Russian.